A helpful chart to provide a quick reference of the filling system that may be appropriate for your product. 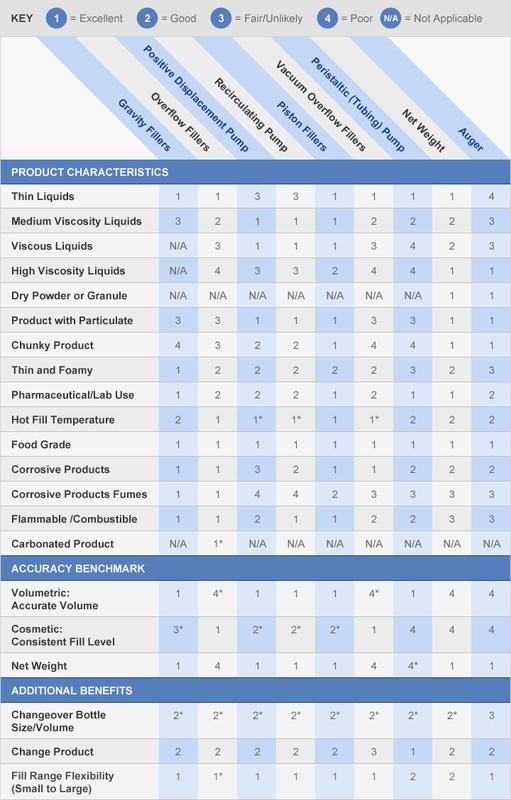 Product characteristics are listed in the first column with a rating for each filler type. The ratings for the systems range from 1-4 with 1 being the most appropriate. If you are not sure where your product fits into the chart, or if you have any other questions, please contact one of our filling system experts with your application details. This chart only provides an overview of the systems we have available for filling your product. Contact one of our filling solutions experts with your application details to create the best system for your needs.